It’s been a busy term in Year 4 with lots going on. 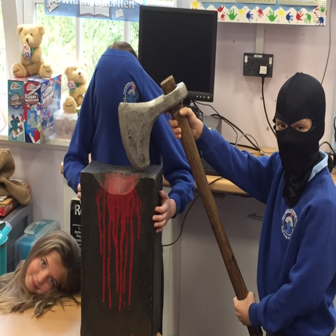 Our class topic has been ‘Off With her Head’ but the work that has been produced has been anything but terrible! The children have actively led their learning by choosing the aspects of Tudor life they wanted to learn about. As part of our topic we have been learning about the Tudors, this included a visit from Mr Richards, a very knowledgeable historian and old friend of Pontarddulais Primary. Mr Richards showed the children many Tudor artefacts which they could handle and study closely. It was a very interactive session. The children had opportunities to practise handwriting with feather quills and made observational drawings of Tudor goblets, crockery and cutlery. They played with simple Tudor toys – a hobby horse, a wooden windmill and ribbon, they also made a pomander using oranges and cloves. The children thoroughly enjoyed the experience, and we took the opportunity to ask him a wide variety of questions during his stay. While we learnt a lot about our topic during the visit, it also gave us a chance to share what we already knew with Mr Richards, and what we would like to know more about.